Ah, the journey of finding the perfect wetsuit. It seems to be one of those things that plagues most triathletes. I have never been a fan of the wetsuit myself. I’d prefer to race in my own skin. But when the water is too cold there isn’t much of an option. Now, I know we have some diehard athletes out there that would swim without a wetsuit in extremely cold waters…Um, yeah…I’m not that athlete either. So, thus began my journey for the perfect triathlon wetsuit. I have tried many brands and many styles of wetsuits. I am certain I have spent close to $1000 dollars on wetsuit rentals combined. Each time finding something that I didn’t like about the wetsuit. There are quite a few popular brands you can rent. There are also quite a few brands out there that you cannot rent and can’t even test before you buy. This makes the search even more difficult because the ones I have tested are the only ones you can rent and they just don’t work for me. The wetsuit must be flexible through the arms. This is crucial. It is hard enough to maintain a consistent stroke for a long distance and even harder when the wetsuit restricts your natural stroke. Nothing like adding resistance to the mix of a long race right?!?! I don’t think so – I need to conserve my energy for the rest of the race. The wetsuit should not restrict my breathing. This is also just as important to me. I don’t have a large chest so I don’t understand why it is so tight around the most important part of my anatomy (lungs)? If you can’t take in air the same way as you do without a wetsuit I see this as a major flaw in the design. Not to mention, it sabotages my breathing technique. The wetsuit must fit snug. Sounds reverse from what my needs are above….but I need both. There shouldn’t be water seeping into the wetsuit. I nearly drowned a couple years back. I had lost quite a bit of weight through training and changing my eating style that the wetsuit I owned was now too big. Unfortunately, I didn’t realize this until race day and not until the race had already begun and I was in the water. Oye, my never ending #triathleteproblems! Absolutely no zipper at the ankles. I rented a wetsuit that had zippers at the ankles. The zipper at the ankles were supposed to make it easier to get out of the wetsuit at transition. It wasn’t until after the race was over did I finally realize where all the blood was coming from. Taking off the wetsuit cut a few huge gashes up the back of my ankles – yes both ankles! So now that I have my criteria I headed to the worldwide web to begin my search. I solicited recommendations from triathlon and swimming clubs as well. I already knew that the wetsuit I would purchase I couldn’t rent to test. I had to rely on if it met my above criteria, the size chart, and just pray I guess! I was going to have to buy the wetsuit based off of the reviews and comments made by others. Oye!!!! #triathleteproblems right? I took the risk anyhow. Through all the searching and reviewing, making sure the wetsuit met my essential criteria I finally settled on the Huub Design Axena wetsuit. I struggled to find reviews on the Huub Design Axena. Especially, very few reviews from people like me. I’m not sponsored, I have never had the privilege of getting equipment shipped to me to test and provide feedback – I’m just an age grouper that is in love with the sport of triathlon searching for the most efficient equipment that meets my needs. Flexibility – I found the Axena wetsuit to be extremely flexible. It really is like a second skin. It felt extremely comfortable. I found it to be very flexible through the arm rotation. It didn’t restrict my stroke which was super important to me. Fit through the Chest- Along with the flexibility concept – it didn’t restrict my breathing. This makes the Axena wetsuit the first wetsuit I have been able to do a three count breath (side to side) in the open water. I have never been able to do that with any other suit. I basically could only take a large enough breath to breath to one side. This lady has a big smile on her face!!! Chaffing – I didn’t have any chaffing around the neck. I did read in a couple reviews that this was an issue so it may be just as simple as making sure you add a little bodyglove around your neck. Buoyance – I seemed well balanced throughout. The buoyance seems perfect. Zipper – Finally comes the zipper. So the wetsuit zipper function wasn’t all that intuitive to me but it isn’t the error of the designers. It was the error of the user not understanding the new technology. I assumed the zipper was the same as all the other wetsuits I had used in the past. So here is where the technology comes into play. 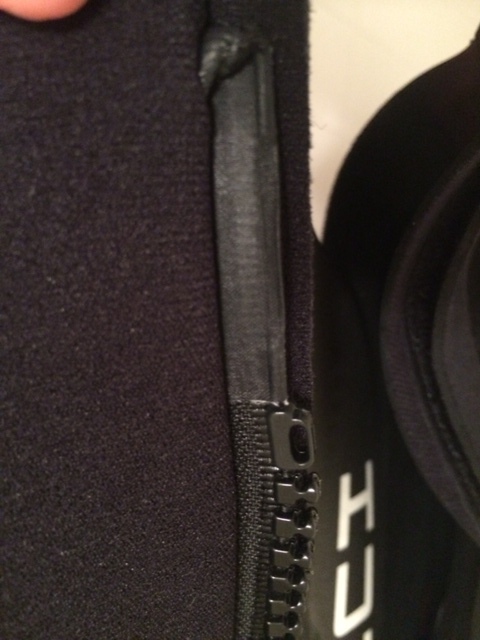 Huub has designed a quick release zipper (more on this in a minute) – out of all the reviews I read and visiting their site I never actually picked up on this. I think I was more focused on finding a more flexible wetsuit that I missed this design point entirely. When the wetsuit arrived in the mail I was super excited to try it out. 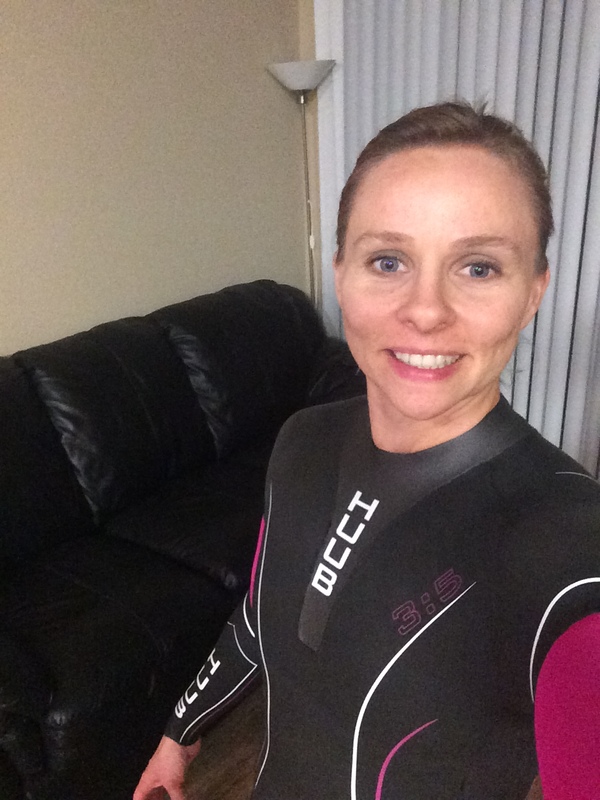 I tried on the wetsuit for fit and it seemed fine but I struggled with the zipper. I thought for certain there was something wrong with the zipper (naively, I never once thought it was me). I was able to get it to zip up a couple times without releasing so I still wanted to give it a go. I got out to the open water swim location and every time I zipped it up the zipper would come off the track and would open completely. Everyone at the open water swim tried to help me out. I didn’t get in the water that day and came home very disappointed. I emailed Huub Design for assistance. While waiting for a response back I decided to search the web to see if there were any comments, complaints, or reviews about the zipper functionality. I found a tutorial on the Breakaway Zipper. I watched the tutorial at least 5 times and had to actually go look at the top of my wetsuit to see for myself and then watched the tutorial again. This zipper zips up to the last nodule pictured below. I was pulling it up past that point. I was in awe over the design. I quickly grabbed the wetsuit and put it back on. I figured out that I was zipping the zipper to far up past the last zip nodule and actually releasing the zipper (the breakaway technology, Korrie, the breakaway technology!!!). You gently tug upward and the zipper releases and you climb out of the wetsuit. So much easier than trying to pull down. I’m a bit gitty over this feature of my wetsuit. What I thought was perhaps a faulty wetsuit was actually a major user error. By the way they did get back to me within a half day and pointed me to the tutorial I had already found. I have had the opportunity to try this suit out several times and this wetsuit just rocks. I have finally found a wetsuit that works and meets my needs. I’m excited to race Oceanside 70.3 in a couple weeks wearing the Axena wetsuit. If you are looking for flexible wetsuit the Axena is definitely worth checking out. We are all built different so take this review for what it is. A review of a wetsuit that I have found to be absolutely perfect for me. I’ll send the link to this to my wife… She’s looking for a wetsuit. Thanks. OMG, this is awesome. I am suppose to be trying out this suit this weekend. After reading your review, I can’t wait. My boyfriend has the men’s version of this and swears by it. His open water swim is faster and easier. Me on the other hand, I bought the Zerod Atlante. I have tried it twice, both times I thought I was going to die, literally. My biggest complaint is the lack of flexibility in the arm motion and the compression In the chest. And it is so hard to get off. I knew after the second open water swim I had to get another one. When you know you can swim better, faster, more comfortably without a suit, you know the suit isn’t for you. Have you ever tried the Zerod Atlante? Did you find it restrictive? I thought maybe it was me who was panicking with the strange feeling of a suit but after reading your review I don’t think its me. its the suit. Another suit I was contemplating was the Zoot Women’s Z Force 3.0 Wetzoot? A friend of mine has it and suggested that one. I have tried the blue seventy and another brand that I can’t seem to remember right now. Both were really restrictive. So restrictive that I couldn’t take the breaths I needed to swim effectively and it would cause that feeling of panic. Now some of that I would definitely associate with not being comfortable in the open water….but not entirely. I also couldn’t take a normal strokes because the suits restricted my range of motion. I was told that I would just get used to it. I haven’t tried Zerod Atlante so I can help with that comparison. The Huub suit is just amazing. I hope you give it a try and let me know how it works for you….I don’t think you will be disappointed. This review is awesome, thanks very much. When you say you are borderline small and medium, was it height or weight? So glad you liked the review. Buying a wetsuit is not an easy task. I took a risk with the huub by using their chart. I have been using this wetsuit for about a year and am finding the medium is just a tad bit big for me now. I am 5’4″ and 150lbs so I would suggest you go with the small. Hope that helps!